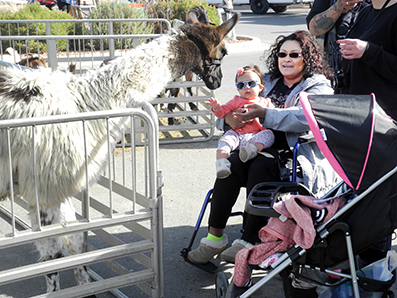 A llama peers out of its enclosure at a curious young girl in the First American Bank parking lot during the petting zoo held Saturday in conjunction with the Artesia’s Booming Health & Business Expo in downtown Artesia. In addition to the zoo, the event featured games, entertainment, and presentations by health professionals at the Ocotillo Performing Arts Center, as well as informational booths, vendors, and special sales inside the district’s businesses. 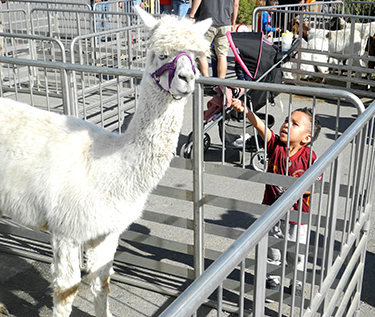 Below, an alpaca opts to pose for a photo before accepting an offering of food from an eager young boy during the petting zoo. 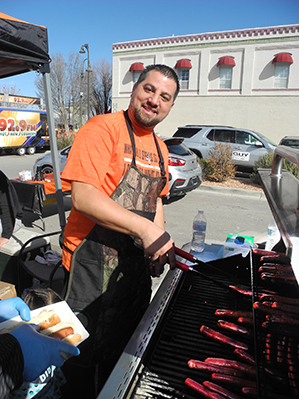 At bottom, Bulldog head basketball coach Michael Mondragon cooks up a fresh batch of hot dogs, provided by Navajo Refining / HollyFrontier and given away free to hungry participants during the event. The ‘Dogs received a donation from Holly for working the hot dog stand.